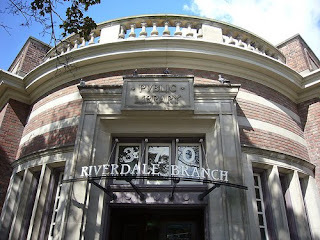 My neighborhood in Toronto had two fabulous libraries (one of them a Carnegie!) within easy walking distance: Riverdale Branch and Pape/Carlaw. And not only did I have access to the literary bounty within their walls, but to the entire TPL system - a world of information ordered to my doorstep. The website meant I had thousands (tens of thousands!) of books at my easy disposal - but DVDs and CDs as well. I went years without paying a movie rental fee, and the extensive catalogue of music meant I was able to sample many great bands I'd heard of but not enough to committ to a CD purchase. Free! Thank you, TPL for giving me Mother Mother, Great Lake Swimmers, Diableros, Luke Doucet, Golden Dogs . . .
* I have yet to get a Halifax library card, and they are not making it easy. This does not bode well for our relationship. More specifically, that moment of the TTC ride home where you emerge from the tunnel darkness into the fleeting, floating space above the Don Valley. Many a sour post-work attitude was spoiled by that hit of sunshine and freedom, especially when I imagined the frustrated faces of the Parkway drivers as I flew overhead. The free LCBO magazine. I regret not keeping more copies when I moved. There were always great recipe ideas and interesting articles, and I eagerly awaited each new edition That's why I went to the LCBO so often, dontchaknow. The Maritimes has the 'Occasions' publication, but it is a poor substitute.